Yes, I got this one. Not my favorite. The world's worst "holiday" is just days away--Mother's Day. For many mothers who lost their children to adoption, it is a day of miserable reminders of the children we do not have, and we approach it with all the joy of someone on her way to her own execution. their birthdays, we first mothers wonder if our lost children remember us on this day. Jane and Lorraine in a happy time many years after reunion. Try as I might, I was never zen about Mother's Day when my daughter was alive. Before I found her, she filled my thoughts, though I did my best to keep busy that day. My mother was still alive, but mostly I was not in the same city as her, so flowers sent and a phone call had to do. But I never acquired the knack of banishing all thoughts of my lost daughter--what she was doing, how she was, where she was. After I found her at 15, I couldn't stop hoping she would call, send a card, do something to acknowledge that I'm her mother too. Of course I imagined that flowers, dinners, et cetera were going on back home to assure her adoptive mother she was appreciated and loved. In my mind, they were better than any Hallmark Mother's Day scene. I never actually found out if all this did happen because I wouldn't ask and certainly my daughter wouldn't have shared anyway. But knowing my daughter's need to prove to her adoptive mother Ann that Jane, our daughter, was indeed a good daughter, and that Ann was the only mother who really counted--well, I imagined something quite grand. Then I could really feel sorry for myself, a poor wretch who often didn't rate any acknowledgment at all. Maybe it's because I never had any other children--I'm one of the vast number of first mothers who chose not to have a second child--but Mother's Day, before, and then after, I found my daughter, was pure hell. No matter how I tried to steel myself against it, the ole' blues came up and got me. Those years she did remember me with a card were wonderful, and I could sail through the day on an even keel. But of course, she didn't remember a great many years--especially when she was living with her parents. "If ever there was a controversial holiday, this is it. The day was established by birth mothers to educate, to remember, and to cope. But, many mothers who gave up their children have feelings of remorse, and often guilt. Many don’t want a special day. ...and the gray in your hair..it says inside. Also preferred! And, of those mothers who want to be remembered, they don’t necessarily want a special day, aside from Mother’s Day. They feel they should remember, and be remembered, on Mother’s Day. From the child’s perspective, adopted children understandably have a high level of anxiety over this topic. A fair number of them don’t want a relationship with their birth mother, adding more controversy to this day. If you do celebrate this day, we suggest you use it to promote education of the issues, and to show compassion and understanding to birth mothers." Hallelujah! Since we have been railing against this idiotic day since we began blogging in 2008, perhaps we have been part of the push back against this insanity--that supposedly was the brainchild of first mothers in Seattle in 1990. Let me add if that is really true--and it did not spring from some adoption agency with the cooperation of first mothers--what were they thinking? No matter who came up with this lame-brained idea, there are apparently conflicting dates over when it is celebrated. According to some sites, Birth Mother's Day is May 4th; other sites are calling it for Saturday, May 7th the day before real Mother's Day. You can take your pick on what day to, er, celebrate. For "mothering" acquaintances and special people. Cool. Cards for "birth mothers" as above are apparently still in vogue. I even found a site where you can special order such a card. And there are apparently cards that thank the "birth mother" for "giving us the world" et cetera. They are designed to make us feel as if we are participating in some warm and fuzzy event, rather than the violent rupture between natural mother and child as they are set adrift. This business of "thanking" the mother is wrong every way you look at it, and can only make the mother miserable. Acknowledge our pain, but do not thank us, or try to tell us that we have given a great "gift." I went to three stores in my area that sell cards yesterday, and found none that had any sort of birth mother cards, though others report they are still out there, especially at card shops (whose numbers are dwindling) that have rows and rows of cards. The joy that Jane's homemade card (above) gave me was boundless. The amusing cards also were much appreciated, and only once did she go with gushy sentimental, which is really not my style. Being remembered at all is what mattered. But for those in a good relationship, please DON'T remind us that we are only birth/first mothers with a card announcing that. Do the folks at Hallmark realize how much we mothers in reunion hate BIRTH MOTHER cards? How demeaning they are? If you are an adoptee and reading this, and don't quite understand why we are so worked up, imagine giving your adoptive mother a Happy Adoptive Mother's Day card on Adoptive Mother's Day, which appropriately would fall on the day after Mother's Day. It's doubtful she will appreciate the precision of your greeting. If choosing any card makes you uncomfortable but you want to send something, write a note on a blank card, or simple stationary. Or you could phone instead. Then you don't have to call your first mother anything but her name. We'll get it. Please don't thank us on this day for giving you up. Just a hello, thinking about you today, will be all we need to hear. YET. Mothers who have not heard from their sons and daughters in years are likely to have a different reaction to getting a birth mother's greeting in the mail, and that is understandable, for any recognition from a child found and lost again is welcome. If this has been on your mind, this day is a good time to open that door again. And to those who won't be acknowledged by your lost daughter or son, don't focus on the day. If you have other children, you are probably going to remember the lost one, but do focus on who you have. For those who do not, instead of waiting for the phone call that may not come, plan for yourself a treat: a comedy, shopping therapy, an afternoon yourself or with another woman at a spa. Avoid teary movies! Since my own mother died, I avoid restaurants because they are jammed and you will see...all those mothers being honored. I'm hoping for good weather so we can garden. "This compilation of essays--beginning with birth mothers, then adoptive mothers, and finally the adopted daughters--goes above and beyond the usual "magazine style" articles on the quirks or perils of the adoption process. Lesbian women, multi-racial families, and a variety of socio-economic backgrounds all lend to this book a wealth of perspectives. The contributors are thoughtful, often in emotional pain, honest about their experiences, and each one is a talented writer. I saw 2 cards under the Title of Birthmother Cards but neither used the term in the card itself. Though one was puke worthy since it thanked her for the GIFT!! The other was OK. It was in a corporate owned Hallmark store. In my 24 Mother's Days since I found Steve, I've only got one actual card. It thrilled me because he addressed it to "MOM" and then my address. I don't remember the card now. It was 18 years ago. Though I kept it and is here tucked away. Since we had our face to face reunion in 1993 (3 years after I searched and found him)he has usually but not always calls me on Mother's Day. I appreciate that. We have been semi-estranged for the past 4 years but he still calls on Mother's Day even if we haven't talked for months. That is important to me and I am glad it is to him as well. Reunion and being a mom and not a mom is a bumpy road at best. My husband and I have a daughter together so I am celebrated by the 2 of them and her 2 children. I am much luckier than most. Still it can be a rough day if I let my mind get wishful or it wanders too deeply. Because of my sweet husband and my sweet daughter I have a nice mother's day. My hard to breath day is his birthday. Story about my daughter and my Mother's Days with her......She once said to me when she caught me in a sad reflection on Mother's Day, "I can plan a terrific day for you and have it go off beautifully, but if he doesn't send a card or call I KNOW you will be sad even though you try to hide it. That's all he has to do." Whew!--Your last sentence says it all. That's exactly how I felt. Eventually, after my daughter and I had been in reunion for oh, 18-20 yeas, I told her it hurt me when she did not remember me on Mother's Day, because the remembrance had been spotty. That year I got flowers. A new author friend of mine sent me your blog because she's reading the book I wrote (fiction) about a birth mother and her journey after being able to locate the daughter she only knew for three short days. I felt for you in reading your blog and thought to myself: how much much your hurt on that day mirrored my own, although I wasn't either a birth mother, or and adoptee. 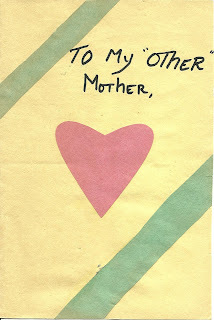 Rather, my own mother expected that I would send her a Mother's Day card, but--although I, too, was a mother--I never received similar acknowledgement from my parents. Happily, after my son was grown, he has always acknowledged me (though sometimes a couple of days late). Nevertheless, I am sending you a virtual to let you know that I connected with your feelings and hope that you'll do something good for yourself this coming Sunday. Kate, I'm confused. Your mother expected a card from you, her daughter, but..you didn't get acknowledgement from your parents? Needs explanation. I want to think they didn't think I needed one, but it hurt that they never acknowledged what for me was an important role, my most important one. 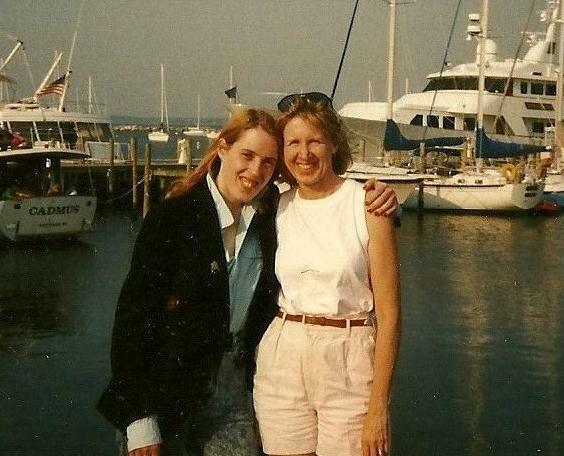 You know, Kate, after many years of knowing my daughter and after a string of years when all was well, I found the voice to tell her that it hurt like hell when I didn't hear from her on Mother's Day. That year I got flowers, and she remembered after that. Until the time that came again when she had to prove to her other mother that she was truly a good daughter and that meant--ignoring me. My only child was lost in a closed adoption for 37 years, before I was able to find him. The first time I ever heard his voice was -- on Mother's Day. But our 10-year old reunion has now evaporated in the flames of his unexamined and unprocessed rage. In New York City, I used to turn myself inside-out when, every year, Spence-Chapin would have an event to "honor the birth mothers." I wanted to march in there with a torch! I hated going, but I longed to be with the other women, very young to very old, who had experienced a loss so similar to mine. At least now, having left NYC, I don't have to make that Sophie's Choice. Thank you for writing, for sharing your loss, your intelligence, your experience. It is such a help to me to know that I am far from alone in these anguished feelings as Mother's Day approaches. Hell, I'm already worried about Christmas! I've been reading FMF for some time now, but I've never posted until now. Im not a first mother so I normally just listen (read). I'm an adoptee, but I come to FMF a lot just to feel I am in the company of others who understand the loss when a mother-child relationship is severed via adoption. For me, Mother's Day is also difficult. I do have a good relationship with my adoptive mother, but the day just brings me a sadness. I miss my first mother deeply and would spend every day with her if I could. (We have a strong bond but unfortunately live in different countries). Mother's Day reminds me that we were separated and I was denied the natural relationship others take for granted. I have a beautiful son, but yet Mother's Day feels sad. Adoption took my mother and now it denies me a happy day as a mother. Though I am not adopted or an adoptive parent, my biological parents closed the door very firmly on me for the last decade of my mother's life. They continued to lavish attention, support (including money), and goodies on my remaining siblings. My parents did not speak to me in the decade before my mother died twenty years ago. I also was excluded from all family gathering(s) after she died. One of my sibs said, "We didn't call you when Mom died because nobody had your number." "It's listed," I replied. It always has been, and my name is odd enough that I'm the only person in the country who has it. "Well, it was busy," she replied, before changing the subject with her usual whiplash speed. So Mother's Day has always been a hard one for me. I maintain low-key expectations with my raised children: a phone call is ample attention paid! Solidarity to all mothers for whom this gooey Hallmark event also is about as joyful as a root canal. In fact, I'm having one on Tuesday: this is a helluva week, no? Frankly, compared with Mother's or Father's Day, I think I'd opt for the root canal. It's over sooner. Lorraine, I know Mother's Day is very difficult for you, and my thoughts will be with you on Sunday. You have done much to help others by way of your own pain. The cards from your daughter are so cute (including the cat), she had a sharp and bright sense of humor it sounds like, from seeing the cards and as you describe her in your book. As do you. It is very hard for me to condemn wholesale, any birth-mother cards. I agree they seem spooky and perhaps similar to the kind of card you would send to a distant relative, to make sure you don't forget about them - neat and tidy. Of course, the birth mother/child relationship is in nature, the closest any of us can get to anyone! I did read a few pages about these cards, looks they are used today in open adoptions; maybe what the pages said can seem like adoption-speak, but I liked what they had to say in terms of respecting the birth mother and thinking of her. It's a great improvement from the 70's when I placed my 2 children for adoption, when a birth mother or single mother was treated only with scorn from her family, neighbors, employer and society. Open adoption can have many pitfalls, and can be seen by some as a sham. But as an older person, it seems like a great improvement over the past, where everything was just a big question mark, subject to whatever lies (some well-intended) could be told. Your post is very meaningful and helpful to all kinds of birth mothers, as well as adoptees I think. I would add that birth mothers should do something on Mother's Day that defines them as a person - an interest that inspires them. A woman is a person, until she has a baby, at which point she stops being a person in the eyes of society, but is only a mother - and a substandard one, at that. Less than a person, less than a man, who is not faulted for his role in how the child came to be. Since women bear the children, they must also bear the sadness, alone. Adoptees, if it helps, as I said in a letter to my older son (which was never answered, and that's OK), when a child it adopted it is usually not because of one bad thing, but a string of bad things happening over time. This is what I believe, for every birth mother that is her experience - pressure from family, society, and a feeling of low self-esteem. It is a women's issue that is little-known. What may seem as "excuses" may actually be "reasons" - it may not help much, but at least it could clear up the mystery of why and how any woman could possibly give up her baby or her child. Believe me, I wish I didn't understand. Through my own experience, I do. Best wishes, and first mothers, do something you are passionate about on Mother's Day. Every birth mother is also a person, and we should not think of ourselves, or be treated as, less than what we should be. Every birth mother does her best, in my view. My heart goes out to all of you first mothers who ache through this day, and to the adoptees who struggle through as well. I wish my daughter's mom a happy Mother's Day every year, and I think of her throughout the day often. I imagine it must be second only to the birthday in terms of sadness and loss and aching. I also remind my daughter to think of her, and we send some pictures and love. I wish they could be together. "The moment a child is born, the mother is also born. She never existed before. The woman existed, but the mother, never. A mother is something absolutely new." New and Old wrote:"Best wishes, and first mothers, do something you are passionate about on Mother's Day." I intend to do that, go to the local pub with my husband and son who lives with us, and eat pub grub and drink! Happy Mother's Day to all, however you celebrate or do not, and those with other kids, be sure to appreciate them and what they do for you and do not let your sadness over the missing one ruin their day and make them feel they are not enough. I know you don’t remember what I recall today. But thoughts of you keep coming, with words I need to say. The first few months were scary when I knew that you’d exist. You couldn’t be real! It wasn’t right! For me…for you…this timing didn’t come with bliss. But something happened. I felt you move. You were alive inside of me. You needed love as well as I. You made me aware. I was able to see. There’s a reason you happened, but I didn’t know why. I only knew there was no time to cry. No time to feel sorry for me and my woes. My mind had to clear, as my child grows. A “Mom” to the baby who was inside of me. I knew that our time would come to an end. What you have forgotten, I seemed to relive! starting before you were born. As I tried to kiss away any wrong. As you lived your life, did you feel it some days? I promised you’d know me when the time was right. With guidance and love as I prayed it should. So, today I remember why I loved you from the start. I pray that I’ve earned some love from your heart. I will always thank God that you were born. As a first mother, I have to remember that I matter, and especially on Mother's Day. Even though I may not be acknowledged on Mother's Day, I know my lost son has 2 mothers, and I matter and am worthy and important. I am the place my child came from, his first home and his first love. On Mother's Day I will smile because he was, is, and will always be my son. I smile because I will always be mother yesterday, today, and forever. Nothing on this earth will ever separate us....not time, not space, not even death. Happy Mother's Day to all mothers, but especially first mothers. You are special, worthy, and important.